Rubin could not and never did listen for long. His idea of conversation (and this was how it usually went) was to strew before his friends the intellectual booty captured by his mind. As usual, he was eager to interrupt, but Nerzhin gripped the front of his overalls with five fingers and shook him to prevent him from speaking. Q: Today is Saturday, aka College Football Day. I am pretty sure I have heard the word "arguably" said at least 15 times on the studio show I am watching. By them saying "Florida is ARGUABLY the best team in college football," are they actually making an argument? SG: This is the cousin of the "having said that" argument Seinfeld and Larry David had on the "Curb Your Enthusiasm" season finale. Either you think Florida is the best team in college football or you don't. By declaring the Gators are "arguably" the best, all you're really saying is that someone could argue they are the best -- which makes no sense, because anyone could argue anything and that doesn't have to mean it's true. If I said Dirk Nowitzki was "arguably" washed up, you would argue, "Wait a second -- he's been great this year; that's the dumbest thing you've ever said." And we would be arguing. In other words, you just proved my point. So "arguably" is a word that means nothing other than, "I don't really believe this, but I'm throwing it out anyway." I love Harris Tweed. People complain about our offices being too cold in the winter. I'm kind of hoping they're as cold as people say so I can break out the tweed jacket. 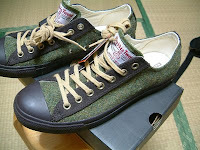 But here's an alternative for folks with hotter offices: Harris Tweed sneakers from Converse. 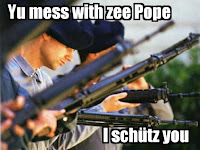 After more than five centuries protecting popes, the Swiss Guard may consider opening the ranks of the world's smallest army to women, its commander said Tuesday. "I can imagine them for one role or another. Certainly we can think about this," Daniel Anrig, who took over the post late last year, told Italian television program "Studio Aperto." Not to go all Bishop Williamson on him, but if the Vatican military starts signing up women we will know the idea of the complementarity of the sexes is close to being completely dead. Clad in flamboyant striped uniforms, the guard's role is largely ceremonial and many of its members still carry around a medieval weapon -- the halberd, which is a combination of spear and battle axe. They wear natty uniforms, but they're fully trained Swiss soldiers who then receive additional training when they arrive at the Vatican. Sure they look smart standing post at the Vatican, but that doesn't mean they're not actually guarding the place. The Pope isn't safe, remember Mehmet Ali Ağca? They're not qualifying on the SIG SG 550 just for the fun of it. The Guard's protective detail role also often gets missed, because they do it in mufti, not in the brightly colored uniforms. In my speech, although I did not use the word "terrorism," I referred to "man-caused" disasters. That is perhaps only a nuance, but it demonstrates that we want to move away from the politics of fear toward a policy of being prepared for all risks that can occur. But shouldn't that be "person-caused disasters"? On the New Criterion's blog Michael Weiss has a piece on why we need Whit Stillman now. It turns out, Stillman does have a feature in pre-production. Hopefully it won't be vaporware! He was interviewed about it and other things by IFC when Metropolitan was available on Hulu recently (it's not anymore). I'm not overly optimistic; his name has been attached to other projects that haven't gotten made. Union News picked up my post on Jimmy Hoffa and the Secret Ballot. Thanks guys! I've been reading G.K. Chesterton's A Short History of England. (The full text is available from the Gutenberg project.) The book includes an interesting section comparing Latin and Greek learning. I'm not sure it's entirely fair to St. Thomas More, but the comparison itself seemd worth sharing. [St. Thomas More] was an innovator in things more alluring to modern minds than theology; he was partly what we should call a Neo-Pagan. His friend Colet summed up that escape from mediævalism which might be called the passage from bad Latin to good Greek. In our loose modern debates they are lumped together; but Greek learning was the growth of this time; there had always been a popular Latin, if a dog-Latin. It would be nearer the truth to call the mediævals bi-lingual than to call their Latin a dead language. Greek never, of course, became so general a possession; but for the man who got it, it is not too much to say that he felt as if he were in the open air for the first time. Much of this Greek spirit was reflected in More; its universality, its urbanity, its balance of buoyant reason and cool curiosity. It is even probable that he shared some of the excesses and errors of taste which inevitably infected the splendid intellectualism of the reaction against the Middle Ages; we can imagine him thinking gargoyles Gothic, in the sense of barbaric, or even failing to be stirred, as Sydney was, by the trumpet of "Chevy Chase." The wealth of the ancient heathen world, in wit, loveliness, and civic heroism, had so recently been revealed to that generation in its dazzling profusion and perfection, that it might seem a trifle if they did here and there an injustice to the relics of the Dark Ages. When, therefore, we look at the world with the eyes of More we are looking from the widest windows of that time; looking over an English landscape seen for the first time very equally, in the level light of the sun at morning. For what he saw was England of the Renascence; England passing from the mediæval to the modern. Thus he looked forth, and saw many things and said many things; they were all worthy and many witty; but he noted one thing which is at once a horrible fancy and a homely and practical fact. He who looked over that landscape said: "Sheep are eating men." Who are the new religious intellectuals? The days when America’s leading intellectuals contained a strong cadre of serious Christians are over. There is no Thomas Merton in our day; no Reinhold Niebuhr, Walker Percy or Flannery O’Connor. It would help if Sullivan could explain who America's leading public intellectuals are. It's possible that the lack of Christian standout intellectuals is partly because there are few standout intellectuals generally. Intellectual culture is more fragmented than it used to be. Beyond that, there are leading Christian intellectuals. Here are some of whom Sullivan might have heard who are formidable and accomplished minds and don't live in any particular religious ghetto: Marilynne Robinson (called by Sullivan's paper "world's best writer of prose"), comedian Stephen Colbert, Gary Wills, Kathleen Norris, and Tim Keller. "Since when is the secret ballot a basic tenet of democracy?" Hoffa said. "Town meetings in New England are as democratic as they come, and they don't use the secret ballot. Elections in the Soviet Union were by secret ballot, but those weren't democratic." The day Jimmy Hoffa shows up at my Town Meeting is the day we move to paper ballots. Of course, town meeting governments sometimes do use secret ballots either for votes over a certain dollar amount or when a certain percentage of the voters request it. The debate calls to mind Jill Lepore's outstanding New Yorker article on why the U.S. adopted the Australian Ballot (that is the secret ballot) for most voting in the first place. It happened surprisingly late. The generally held argument that this sort of struggle washes away, as it were, the stains that calumny or insult has brought upon the honor of citizens surely can deceive no one but a madman. ... It is, to be sure, the desire of revenge that impels passionate and arrogant men to seek satisfaction. God commands all men to love each other in brotherly love and forbids them to ever violate anyone; he condemns revenge as a deadly sin and reserves to himself the right of expiation. If people could restrain their passion and submit to God, they would easily abandon the monstrous custom of dueling. It sends the wrong message to children about dealing with the consequences of decisions. I'm hoping to get out for some Indian food again soon. This listing from the New York Times of resturaunts offering "More than Tandoori" caught my eye. I've made some updates to the sidebar. It lists some of my friends' blogs and other things I read. I'm hoping to get some substantive posting up over the long weekend. I'm also looking to buy enough bookshelves to let me get rid of the last of my boxes from moving in September. We'll see if either of those actually get done! In the meantime, watch the shared items and status feeds for shorter updates. Tina Brown, like the poor, we have always with us, apparently. Having made the transit from Tatler to Vanity Fair to The New Yorker to the ill-fated Talk, she has at last fetched up, like every other bit of journalistic flotsam, including yours truly, on the Internet.